I've turned to something of a favourite of cookbooks of mine The Dairy Book of Home Cookery. I've made a number of recipes from this cook book including Cherry Cupcakes and Hot Cross Buns and now I have discovered another Yorkshire Tea Cakes. Tea cakes are a favourite of mine, particularly if I am out and about and want something other than cake with a cuppa. Sift flour and salt into bowl and rub in the butter. Add sugar and currants, mix lightly. Dissolve 1 tsp sugar into lukewarm milk and sprinkle yeast on top. Leave for 10 minutes in a warm place until frothy. 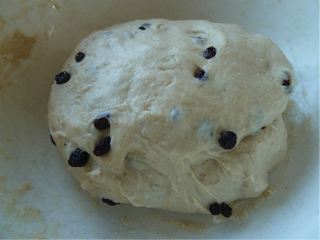 Add all at once to the dry ingredients, mix to a firm dough. Add extra flour if needed, until dough leaves sides of bowl clean. Turn out onto floured surface. Knead for 10 minutes the dough should feel elastic. Turn out onto floured surface, knead well. Divide into 6 equal sized pieces. Roll each one into a round cake 1cm (1/2 inch) thick. Transfer to greased baking sheet and brush tops with milk. Cover and leave to rise until almost double in size. Bake 200 degrees C for 20 minutes. You may need to cover in foil if they are browning too quickly. 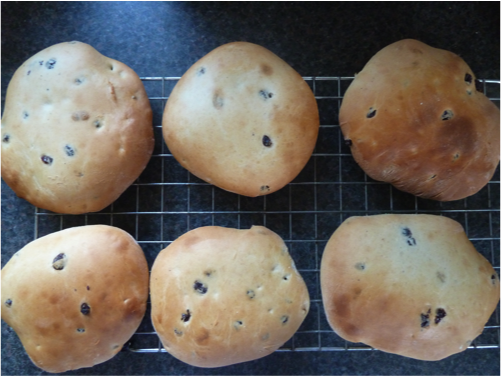 I sneakily ate one of the tea cakes fresh from the oven with a little butter, they were light and fresh and perfect! They were still equally perfect a little later on when toasted with lashings of butter. I am submitting this recipe as part of the Best of British Blogging Challenge over The Face of New World Appliances this months theme is Yorkshire which is most appropriately hosted by Karen at Lavender and Lovage. There were so many different great Yorkshire based recipes to choose from but in the end settled for Yorkshire Tea Cakes. Although I very much looking forward to seeing some of the lovely recipes other fellow bloggers bake. I'm also posting this recipe for the August Alpha Bakes Challenge hosted by Ros at More than Occasional Baker and Caroline Makes, with Ros being this months host. This months letter is T for Tea Cakes! These look great especially when toasted and covered in butter! Thanks for entering AlphaBakes. Thank you I do love the AlphaBakes challenge! I've nominated you for an award! Wow ! Thank you so much Evi I will be by shortly to collect ;) my award. Yes do try them they are delicious! Ohhhhh tea cakes. An ideal recipe for me to try once we reach autumn, toasted and spread with lots of butter. Yours look great. perfect for lunchtime and before you know it Autumn will be here - eek did I just wish away the Summer! I will be baking these Yorkshire Tea Cakes today as I bought all the ingredients especially - They are my favourite! !